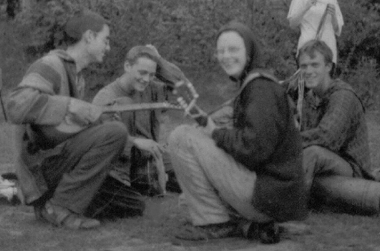 A collection of semi-improvised saz and mandolin pieces recorded in a barn in Cadamstown, Co. Offaly, Ireland in May 1997, immediately after the 1997 Treewalk. These were all recorded in a barn at the Rigney family farm in Cadamstown, Co. Offaly at the Rainbow Gathering which sort of happened in conjunction with the end of the Treewalk. We'd arrived there at Beltaine, miserable weather, and Blair's New LabourTM government had just come to power in the U.K. The Tascam 4-track tape machine we'd abandoned in Ennis during the early part of the Walk was heroically retrieved by Kris, and Dinger from Naas (who Andy had worked with in the woods down at Innishannon while training up Zymbii the mule) offered to work the controls. I'm not sure if the super-electric trebly saz sound was what he intended, but Inge's mandolin sounds undeniably gorgeous. Andy's djembe is unfortunately low in the mix, but he can be heard offering 'round his chai at the end of track 2. These are some slightly sloppy but spirited renditions of tunes (traditional and our own) which we had been playing a lot during the Walk. "Caravette and Chanavesse" was a tune Inge had learned off some sheet music (from where?) that winter. I'm not entirely convinced that's the real title - no one else seems to have heard of it. This tune will always bring to mind the image of Louise (from Future Forests) dancing a hornpipe with the Collards' friend Noel in the front room of Maugha as Inge and I sat playing it by the fireside. "Betsy Bell and Mary Gray" we learned off a lovely Scottish minstrel called Jamie who was the first person we met when we first arrived at Future Forests in 1995 - we've not seen him since. It's a dirge about two women who live together in a bender by the river, much to the displeasure of the local men (who come and burn it down). He learned it off "a feminist" in Scotland and we re-invented it as a sprightly Celtic tune. Inge learned "Buttermilk Mary" from a tune book Brian brought on the walk - that was probably our favourite traditional tune of that time, along with "The Old Copperplate" and "Jenny's Chickens" (as played by Janie on her pennywhistle). The "unidentified Irish tune" was taught to us by Kris, in the sincere belief that it was Breton. I've since heard a recording of an Irish ensemble playing this 'properly' with a couple of additional parts, but we usually managed to get a bit of a vibe going with our stripped-down version.